Review posted January 23, 2015. Loyola Press, Chicago, 2014. 150 pages. 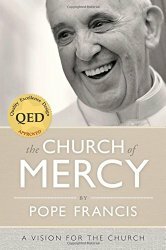 I’m not a Catholic, so I was surprised how much I was uplifted by this book. They are basically sermons Pope Francis has preached, and they retain the feeling of the spoken word. (More exclamation marks than you would use if it was originally in written form, for example.) They are short, and one chapter at a time made a nice addition to my daily quiet times. Whenever we Christians are enclosed in our groups, our movements, our parishes, in our little worlds, we remain closed, and the same thing happens to us that happens to anything closed: when a room is closed, it begins to get dank. If a person is closed up in that room, he or she becomes ill! Whenever Christians are enclosed in their groups, parishes, and movements, they take ill. If a Christian goes to the streets, or to the outskirts, he or she may risk the same thing that can happen to anyone out there: an accident. How often have we seen accidents on the road! But I am telling you: I would prefer a thousand times over a bruised Church to an ill Church! A Church, a catechist, with the courage to risk going out, and not a catechist who is studious, who knows everything but is always closed — such a person is not well. And sometimes he or she is not well in the head . . . But, careful! Jesus does not say, Go off and do things on your own. No! That is not what he is saying. Jesus says, Go, for I am with you! This is what is so beautiful for us; it is what guides us. If we go out to bring his Gospel with love, with a true apostolic spirit, with parrhesia, he walks with us, he goes ahead of us and he gets there first. You can see that there are inspiring thoughts here for Christians of all flavors. And the overall message is indeed to become a church of mercy and a church known for love. You could say to me, “But the church is made up of sinners; we see them every day.” And this is true: we are a Church of sinners. And we sinners are called to let ourselves be transformed, renewed, sanctified by God. Throughout history, some have been tempted to say that the Church is the Church of only the pure and the perfectly consistent, and it expels all the rest. This is not true! This is heresy! The Church, which is holy, does not reject sinners; she does not reject us all; she does not reject us because she calls everyone, welcomes them, is open even to those furthest from her; she calls everyone to allow themselves to be enfolded by the mercy, the tenderness, and the forgiveness of the Father, who offers everyone the possibility of meeting him, of journeying toward sanctity. “Well! Father, I am a sinner; I have tremendous sins. How can I possibly feel part of the Church?” Dear brother, dear sister, this is exactly what the Lord wants, that you say to him, “Lord, here I am, with my sins.” Is one of you here without sin? Anyone? No one, not one of us. We all carry our sins with us. But the Lord wants to hear us say to him, “Forgive me, help me to walk, change my heart!” And the Lord can change your heart. In the Church, the God we encounter is not a merciless judge but is like the Father in the Gospel parable. You may be like the son who left home, who sank to the depths, farthest from the Gospel. When you have the strength to say, “I want to come home,” you will find the door open. God will come to meet you because he is always waiting for you – God is always waiting for you. God embraces you, kisses you, and celebrates. That is how the Lord is, that is how the tenderness of our heavenly Father is. The Lord wants us to belong to a Church that knows how to open her arms and welcome everyone, that is not a house for the few, but a house for everyone, where all can be renewed, transformed, sanctified by his love – the strongest and the weakest, sinners, the indifferent, those who feel discouraged or lost. I love that his exhortations sound like something I could hear in a Protestant church. Truly, we are one Church. We are not Christians “part-time,” only at certain moments, in certain circumstances, in certain decisions; no one can be Christian in this way. We are Christian all the time! Totally! May Christ’s truth, which the Holy Spirit teaches us and gives to us, always and totally affect our daily life. Let us call on him more often so that he may guide us on the path of disciples of Christ. Let us call on him every day. I am making this suggestion to you: let us invoke the Holy Spirit every day; in this way the Holy Spirit will bring us close to Jesus Christ. Worshipping the Lord means giving him the place that he must have; worshipping the Lord means stating, believing – not only by our words – that he alone truly guides our lives. Worshipping the Lord means that we are convinced before him that he is the only God, the God of our lives, the God of history. This has a consequence in our lives: we have to empty ourselves of the many small or great idols that we have and in which we take refuge, on which we often seek to base our security. They are idols that we sometimes keep well hidden; they can be ambition, careerism, a taste for success, placing ourselves at the center, the tendency to dominate others, the claim to be the sole masters of our lives, some sins to which we are bound, and many others. I would like a question to resound in the heart of each one of you, and I would like you to answer it honestly: Have I considered which idol lies hidden in my life that prevents me from worshipping the Lord? Worshipping is stripping ourselves of our idols, even the most hidden ones, and choosing the Lord as the center, as the highway of our lives. I’m glad I read this book, and glad to catch a glimpse of the heart of Pope Francis. I’m encouraged that a man with such a heart is leading the Catholic church.